Clarissa's First time meeting a mermaid...not so sure....totally scored on getting to ride the new Little Mermaid ride (opening in Dec 2012) and checking out her new grotto....BEFORE they open....they called it a dress rehearsal.....I'm fine with whatever they call it! 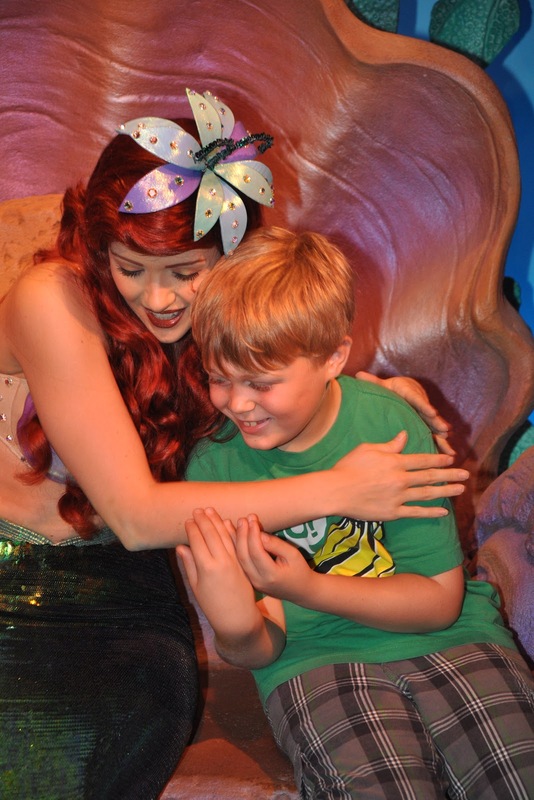 We can't forget Mason's first love....Ariel! Super happy to meet Daisy Duck.....no fear! Maybe it was us holding her back for 15 minutes before she could run up and hug her. It was all about meeting MINNIE MOUSE!!! It was super cute when Minnie pointed to herself, then made a heart hand and then pointed to Clarissa's dress. Yummy Mickey Ice cream cone in a cup! Haircut time, Mason requested a spiky haircut with Pixie Dust (photo to come). Not counting bang trims this was Clarissa's first real big girl haircut (she also got pixie dust and mouse ears). All done with the Main Street Barber Shop. Chatting with Nana about the magical powers associated with Pixie Dust. Eeeek! Preview of coming events.....Mason driving his own car! All in all....fun day at Disney!